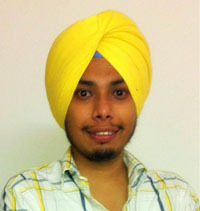 I have done my M.Sc from Panjab University, Chandigarh in 2008. I joined IISER Mohali in August 2009. I am working under the supervision of Dr Lingaraj Sahu. I am working in the area of Operator Theory. My research contains the study of quantum dynamical semigroups. We are working on dilation of a class of quantum dynamical semigroups with unbounded generators on UHF algebras.